A good umbrella should keep you dry during a downpour, but the practical accessory hasn't seen much improvement since its inception. 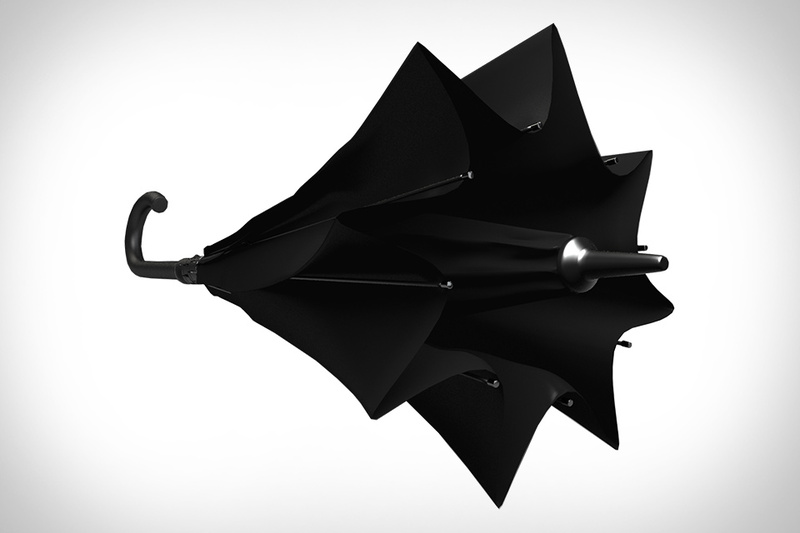 The designers of Kazbrella patiently developed their product, focusing on some of the common problems umbrellas have, while maintaining the shape and feel you're already used to. The Kazbrella is drip free — opening upwards instead of down, keeping your floors dry after it's neatly closed. That same design allows you to close it quickly and neatly when you're walking inside or hopping in the car. And since it's double spoked, it will stand up to strong winds, but even if it does blow inside out, getting it back to it's more helpful shape is as easy as a push of a button. Carrying a battery pack isn't unusual. But normally it takes up room in either your pocket or your bag, whether it stands on its own or attaches to the back of your phone. The Xoo Phone-Charging Belt keeps your pockets and bags clear by placing the power on your waist. Available in polished zinc or Casely-Hayford imagined black, it packs a next-gen 2100 mAh Lithium Ceramic Polymer battery into the buckle, which is paired with your choice of black or brown leather straps. A good rule for accessorizing: if it doesn't do something functional, it's probably not worth wearing. The Wrist Ruler is a perfect example. Resembling a plain leather bracelet from afar, it actually doubles as a ruler, with laser-engraved inch and centimeter markings and a handsome silver post. Individually numbered and made in small runs in a Portland, OR workshop. Using a mix of materials, the Grifter Onyx Ranger Glove keeps your hands warm when the temperatures drop. The tops of the gloves are covered in American Mills Cone Selvedge Black Denim, while the palm and inside of the fingers is covered in black deer skin. Add to that the wool lining and extended, scalloped cuffs, and you've got a fashionable glove that will keep you comfortable no matter what you're up to. Made in the USA. Given its name, you'd expect the Nanamica Utlity Scarf to offer more functionality than your typical neck-warmer. And you'd be correct. Constructed using a lightweight wool blend knit for the exterior and full mesh lining, it offers a concealed zippered pocket that's great for carrying smaller items. Available in a traditional navy and green tartan pattern with navy lining. Odds are if you own a good pair of sunglasses, they probably came with at the very least a storage/cleaning bag, and most likely some sort of hardshell case. But those cases can be bulky, and are rarely stylish. This Tanner Goods Sunglass Case is both small in size and good looking. Handmade to order in Portland, OR from 5.5 oz. Horween Rich Chromexcel leather and available in five different colors, this case features a unique design with two folding arms that slot into the body, a large wrap-around piece that secures with a brass button stud, and enough room inside for most pairs of shades. Forget the oversized cuts, crazy patterns, and garish colors of most boardshorts you'll find at the nearest Pac Sun — if your plan is to look stylish at the beach, these Isaora Swim Trunks are a way better place to start. Made from 100% Japanese nylon and lined with mesh, these trunks are designed to dry as quickly as possible, and also pack in features like two mesh-lined side pockets, a rear pocket with laser-cut holes (so it doesn't fill up with water), and a zip fly. Available in four tasteful coloways.